Happy Easter bunnies! As a child, it used to be probably my favorite holiday. Egg rolling, eating chocolate and just enjoying spring (if there was no snow outside of course). This year it's different. I mean holidays have changed a lot for me since I moved out, started university, working and so on. They just became a day off basically, where you are obliged to write something meaningful on your Facebook or you have to remind yourself not to forget to send ten messages to your family and friends wishing a happy holiday. Or maybe it's how I see it. But it's totally fine! I'm ok with that. In fact I really enjoyed my boiled egg on avocado this morning and a kinder surprise (you're never too old for those) haha. So although Easter or any other holiday may not be the same as when it used to be as a kid I am still happy and excited about them. There is just something special about that day. I hope however you are celebrating your Easter Sunday, alone or surrounded by family, that you are having a lovely day. Sending you a big hug! 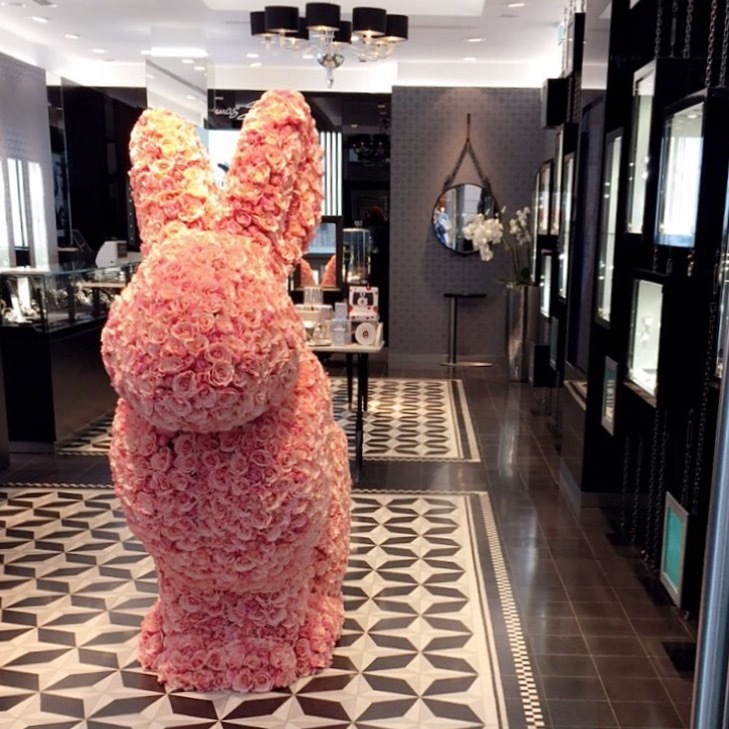 P.S I saw this incredible rose bunny at a Thomas Sabo store when I passed by the other day. I've never seen anything like it before. It's so beautiful! Happy Easter once more to you all. I spent this Easter morning blogging and watching Ghostbusters (hah!) so I can totally relate to that odd feeling that you should be doing something reminiscent of your childhood holidays <3 Happy Easter! That rose covered bunny is darling!! I really like your honesty in your post!! Can I be honest? I'm not religious (anymore!! ), so I find a lot of holidays off putting... and they really are just a day... unique in the fact that many are off from work... but it's a day... and it is indeed nice to spend it with loved ones... certain holidays, though, I should say Christian holidays, I simply do not make a big fuss over the religious aspect. Hope my blatancy isn't offensive! Your avocado and eggs toast sounds delish!! Hope your day was awesome! This rose bunny looks amazing - love it!